This red currant and lime sorbet was a result of a purchase of frozen red currants for a recipe that I never ended up making. I used some of the red currants in a second batch of fruit mince and the rest to make my sorbet. I like the texture of the pips, but you can strain the mixture before churning if you would prefer it totally smooth. I am in serious need of a lot of sleep! And hopefully by the time this blog post goes live, I will have had at least 2 nights in a row of decent snooze time. The week before our new puppy came home I really battled to sleep. It was kind of like my body was preparing me for the lack of sleep that any new baby brings into a house. The Friday before we collected her I wanted to get to bed early and sleep in late, but somehow that plan did not work out at all. We were up with the sun and headed off to the racetrack to watch the motor racing before making our way to Hout Bay. My cousin was getting married, and we had booked into a bed and breakfast for the night. We checked in, had a shower and a cup of really bad coffee before we left to drive the bridal party to the venue. We left the wedding just after 23h00 and with a 10 minute drive back to where we were spending the night, I expected to be asleep before midnight. Sadly, this was not the case as the room was too hot, even with the door open. I had a fitful night’s sleep and could not even sleep in as the breakfast service ended at 9am! The only thing decent about our breakfast was the coffee. Which was followed by an espresso at Truth Coffee Shop in Cape Town before we went to collect Scarlett. She is an adorable Boxer who is very intelligent. But her first night was not a good one and from when we went to bed at 22h00 she woke up every hour crying. Not for her 7 siblings or her mother, but at her inability to get onto the couch where Molly, our Jack Russell sleeps. Monday night she managed to stretch her sleep to 90 minute bursts and on Tuesday night she actually managed to sleep for a two hour stretch, followed by a solid 4 hours. Of course this is as much sleep as I got. On the Wednesday night she slept through, having realized she cannot get onto the couch, but Dave had to be awake at 4am on the Thursday morning and I got up with him and had my first cup of coffee. My plan was to struggle through the day, limiting my coffee intake to my usual 3 cups, and get an early night to make up for all the lost sleep. My other plan included eating ready prepared food for dinner – left over spatchcock chicken and my red currant and lime sorbet. I am absolutely loving the pictures of the newest addition to your family, I found when we go Little Chef, I didn’t want to sleep. Ha! All my free time was spent admiring and hugging and loving my most favourite being on the planet, still a year down the track and I would skip the sleep to spend time with my fur baby. 🙂 Love the sorbet recipe too, shared it on my FB page and it had a number of peeps ask after it. This looks like the perfect treat to celebrate the arrival of your new family member! So excited about the new puppy!!! Squeeee!! Hi Tandy, what a vibrant color, looks delicious and very flavorful. Scarlett sounds adorable, hope you get some sleep soon. Take care! Thanks Cheri, I hope so too! Ooooh, I want to see lots of puppy pictures! This sorbet looks beautiful, I love the bold colors and I can only imagine how good it tastes! 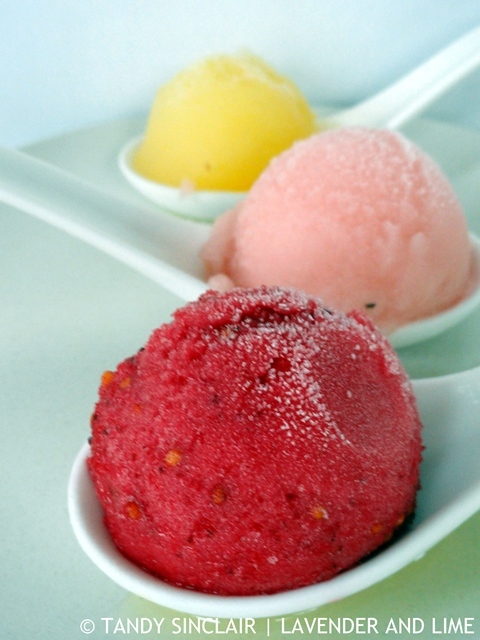 I think this sorbet looks absolutely marvelous ~ so refreshing and pretty in color. And sleep. Sigh. Isn’t sleep everyone’s love language? I’d rather sleep anyday than eat! Haha, I feel exactly like that right now! Sorberts are the best! So refreshing and mouth watering!! I always feel so sorry for little animals when they are taken away from their mother and siblings even though they go to the most loving homes. Your sorbet sounds heavenly, great combination of flavours. Hi Tandy, these are absolutely adorable. So yummy and pretty! Wow the sorbet is such a brilliant red! I have never had real red currents before!! We don’t seem to get them here at all. I smiled that the currents were originally destined for a different recipe, that happens to me ALL the time, sometimes I even forget what I intended to make with a specific ingredient! Perfect for this hot hot autumn weather. How is your new little fur ball? Seen your photos and so adorable but I am sure at 2:30am the whole adorable thing when they are whining is no longer adorable. I promise this phase will go quickly and in the mean time reboot and re- energize with some delicious sorbets. Love these flavours. Congrats on your new addition, Tandy – and sorry to hear about your lack of sleep – hoping things get into a better flow and sleep once again becomes a priority – but till then – there’s dessert as delicious and refreshing as this! Yum. They look so pretty and delicious! This looks so refreshing. Something I will definitely be coming back to when the weather gets better. Hope your warm weather hurries up! Such a beautiful looking sorbet! Hopefully Scarlett will soon settle and bring you many many years of joy.